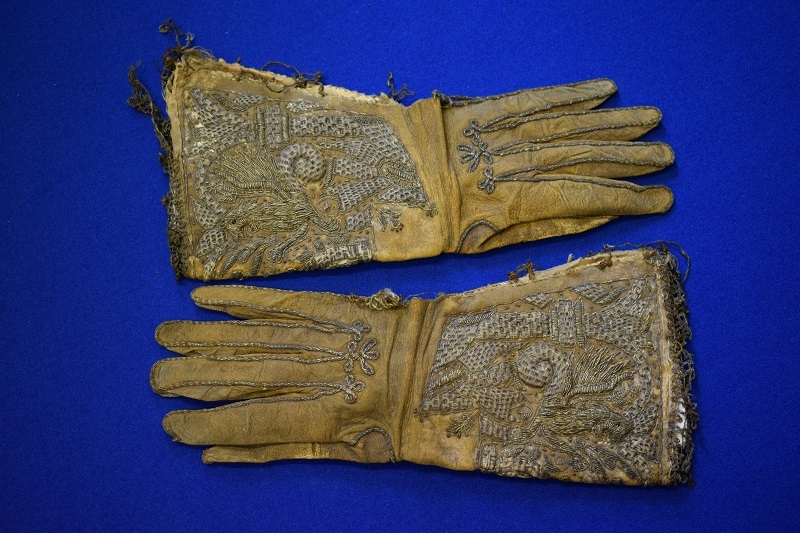 A pair of leather gauntlet gloves with metal thread embroidery, believed to have belonged to Maister Peter Lowe, the founder of the incorporation now known as Royal College of Physicians and Surgeons of Glasgow. They may possibly have been given as a gift to symbolise loyalty and service, as was customary. The gloves were donated to the College by Mrs Hamilton Gray, the widow of the Reverend John Hamilton Gray, in 1867. Reverend John Hamilton Gray was Minister of the Parish of Carntyne and was a descendent of Maister Lowe, his family having married into the Lowe family. The embroidery work which they display is undoubtedly of a professional nature. The formal pattern of foliage, mythical animals, and cupola within arched pillars is typical of the period 1600-1620. The outlining of the fingers of the gloves with metal braid and the depth of the gauntlets suggest the date of around 1600-1610. 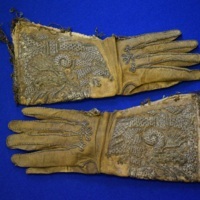 “Maister Peter Lowe's Gloves,” Heritage, accessed April 25, 2019, https://heritage.rcpsg.ac.uk/items/show/37. Description: A pair of leather gauntlet gloves with metal thread embroidery, believed to have belonged to Maister Peter Lowe, the founder of the incorporation now known as Royal College of Physicians and Surgeons of Glasgow. They may possibly have been given as a gift to symbolise loyalty and service, as was customary. The gloves were donated to the College by Mrs Hamilton Gray, the widow of the Reverend John Hamilton Gray, in 1867. Reverend John Hamilton Gray was Minister of the Parish of Carntyne and was a descendent of Maister Lowe, his family having married into the Lowe family.